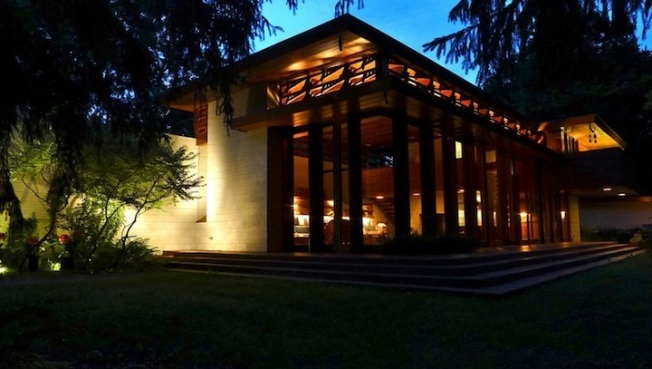 To save It from flood destruction, owners may ship Frank Lloyd Wright home to Italy. Owners of a stunning Frank Lloyd Wright home wish to ship the masterpiece across the Atlantic to preserve it. Today, the Bachman Wilson House, a stunning Frank Lloyd Wright masterpiece, sits in Millstone, New Jersey. But it might soon have a new address in Fiesole, Italy, if the owners can find someone to cover the cost to move the home across the Atlantic, reports the New York Times. Wright lived in Fiesole with his mistress Mamah Borthwick Cheney in 1910 after he escaped to Italy when his affair was exposed. In 2010, Italian architect Paolo Bulletti organized an exhibition in Fiesole to celebrate Wright's ties to the serene Tuscan town. The Bachman Wilson House’s owners, Lawrence and Sharon Tarantino, also the owners of an architecture firm in New Jersey, contacted Bulletti when they heard about the exhibition and spoke with him about moving the house to a place that Wright loved. The Tarantinos bought the 1954 “Usonian" style structure in 1988 in poor condition and renovated it back to its original fabulousness. However, its proximity to the nearby Millstone River presents impending doom. The flooding has become worse over the past few years, and the Tarantinos say the only way to save the house is to move it. The cost for this dream? $1.5 million. And that's the price for the house, furniture, dismantling, packing and shipping of the home to Genoa. Rebuilding it would be a whole new price tag, so the Tarantinos are hoping to find a sponsor for the project. Due to planning regulations in Fiesole, further research is required in order to determine whether the house can be used as a residence, but it can stand as a work of art on protected land, a park or garden, as a sight for tourists and locals to ogle. So some are hopeful that public institutions in Florence, Fiesole, or Venice will foot the bill, and host the home as a tourist spot. Moving the home to Italy is a dream among many. The Tarantinos are open to moving the home to locations in the U.S. as well. “Our main concern is that the house be located on a natural wooded site with the proper solar orientation, and that there is a relationship between the site and Wright,” Ms. Tarantino told the New York Times. And that dream doesn’t seem too far fetching at all.